Satisfy customers quickly and easily across all channels. A simple, cost effective, ready to go solution enabling you to delight customers by offering rich personalised and memorable experiences. Cloud hosted, there is no hardware/software installation or integration required so you can be set up in as little as 6-12 weeks. Internet access is all you need to connect across the world. Is Genesys PureCloud for you? Identify customer frustrations and take action fast with optional analytics. Uses the internet and the PSTN - no dedicated network or data and voice design needed. Control operations from the office or when mobile via a simple web interface. Works with most existing phone and CRM systems. 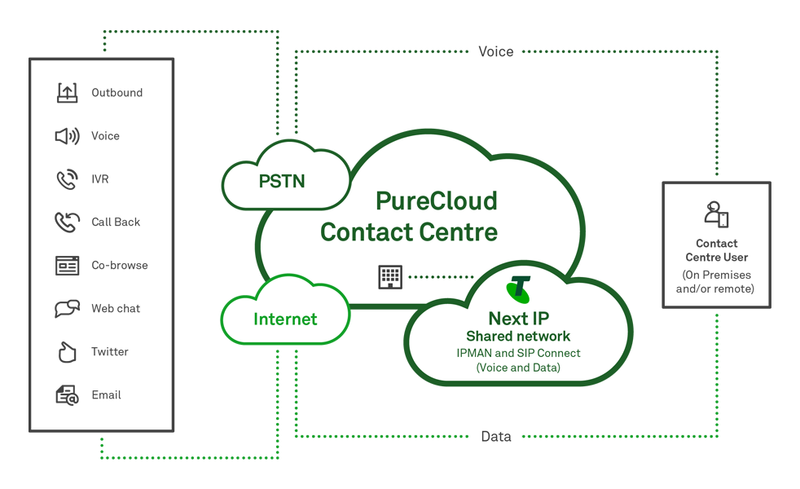 PureCloud is ideal for organisations wanting a simple ready to go Contact Centre solution starting at just 10 seats and scaling up to 500 plus seats for those larger businesses with simpler requirements too. Telstra is the only provider supplying the 100% in-the-cloud PureCloud solution within Australia. We also offer the dedicated model where we can connect your dedicated SIP trunks and phones via your Telstra Next IP network. Secure Pause and Secure IVR have been validated by an external Qualified Security Assessor as Level 1 PCI DSS-compliant. Both Secure Pause and Secure IVR are certified for PCI Compliance with either local Edge devices or with virtual edges and PureCloud Voice in any deployment region. One simple price includes all calling costs from inbound to agent desktop, and outbound for agent transfers. With a choice of plans, costs are based on a monthly, price for a 12, 24 or 36 month term, with the ability to burst capacity on demand. For all channels - single queue or multiple queues. For common applications such as SalesForce, ZenDesk and MS Dynamics. Connect or create your own applications. Cloud-based. Voice, touch phone, text to speech. Monitor queues and agents and respond in real time. Not all features may be available in all PureCloud Plan types. Refer to your Telstra Sales Specialist for more information. IVR for PureCloud Contact Centre has an included number of minutes (based on your PureCloud licence type and number of licences) in your plan. Any additional usage above the included minutes are charged on a per minute basis. You must use Telstra Inbound Services (1800/1300/13 numbers) and ICCD (in control call direct) for the delivery of inbound calls. A minimum spend of $1000 per month on a PureCloud Plan is required. SIP trunks via Telstra SIP Connect. For the Dedicated Model, network costs are additional to PureCloud Contact Centre Genesys Powered costs. Western NSW Local Health District (LHD) supports the public’s needs in the areas of Oral Health and Child Well Being in the remote regions of Western NSW. Western NSW LHD requires a reliable and adaptable Contact Centre application to inform customers of new information as well as optimising the available resources across the district. PureCloud Contact Centre Genesys Powered is a cloud-based contact centre that provides organisations with the flexibility to scale from 5 to 1000+ agents. Multi-channel capability enables a single view over all customer interactions in real time through an intuitive management and reporting portal. Operations are more resilient with a full cloud model that removes reliance on any one particular site or telephony environment.